Evolution Motorsport is proud to announce the EVR450 Performance Package for the 2015-2016 Porsche Cayman GT4 and Boxster Spyder! The EVR450 performance package is built upon the gains made with the EVR425 performance package, which uses IPD's Competition Plenum and 82mm throttle body to improve intake flow. To take the 3.8L engine beyond the EVT425 power level we turned our attention to its exhaust--in particular, the exhaust manifolds. The stock catback system was found to be free-flowing, lightweight, and has an aggressive sound so we have not pursued development of a replacement system. Since the advent of the 991 and 981 platforms, we have observed that Porsche have dramatically improved the design and construction of their stock exhaust manifolds and catalysts, using hydroformed bends and computer design to build exhaust systems that leave little on the table to improve upon. In testing with short and medium length header with high flow cats, we found only minimal performance gains over stock were possible--an unsatisfactory result for a product that would cost in the neighborhood of $3000-4000 to produce and be put to the test on the track by enthusiast owners. Not resting on our laurels, we looked outside of the box and began designing a motorsport-focused, catless, equal-length long tube race header together with our partners at Ardent Performance Exhaust. By eliminating the catalyst and utilizing all available space underneath the car, we were able to build a header with much longer primary tubes and and longer collector than stock, and the crown jewel of the EVR450 kit was born. 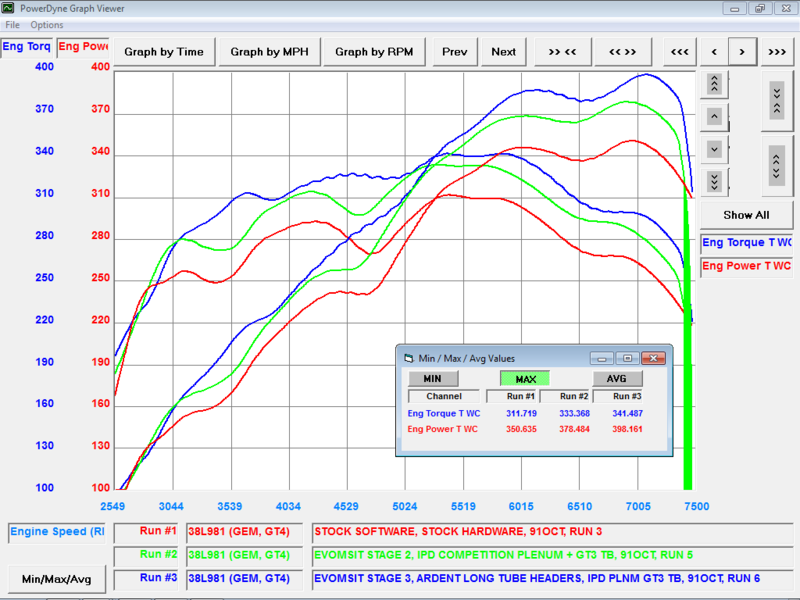 After careful tuning, this substantial design departure from the stock manifolds generated very large gains throughout the powerband, completely eliminating torque dips at 3700 and 4700rpm and giving the EVR450 kit peak gains of more than 50hp over a stock GT4 and 20-25hp more than the EVR425 kit. At no point beyond 3000rpm is power lost compared to the stock manifolds, and engine response and power at low RPM as at least as strong as a stock car. The greatest increase occurs at 4700rpm, where dyno testing shows the car gaining a MASSIVE 58lb-ft and 51hp at the ground compared to stock, completely transforming the performance where it is needed to launch the car out of 2nd and 3rd gear corners. Launched as a brand in 2017, Ardent Performance has a background of building performance exhaust and headers for everything from high performance street cars and exotics, to indy cars and GT cars, to off road vehicles and snowmobiles for more than 20 years. Handmade from scratch in Phoenix, Arizona, USA from 100% American materials, their Cayman GT4/Boxster Spyder Long Tube Race headers are constructed from 304-series stainless steel with TIG-welded and backpurged construction. Unlike our competitors, we believe a properly constructed and fully welded collector is the proper and more reliable solution for long term, race track-durable header on this platform. Along with the Ardent Performance long tube race headers, IPD Competition Plenum, and 82mm throttle body, EVOMSit software was developed specifically for the EVR450 hardware to ensure the total package achieves maximum power and crisp throttle response at all engine speeds. Installed over the OBDII port using the included TUNEit Gen 2 flash tool, this software also guarantees no check engine lights will be present due to the modifications. Software is available in 91, 93, and 100 octane (95, 98, and 102 RON) variants, and incorporates Intelligent Tuning's Integrated Switching Technology to safely and automatically adapt ignition timing to deliver the most safe performance for your fuel and conditions. Options such as left foot braking and a raised rev limit are available upon request. Unlike our competitors, our headers do not lose power compared to the stock headers around 4000rpm!